Qana — He came, he saw, he conquered. As he watched the Iranian President blow kisses to cleaning workers at Beirut’s airport during his departure for Iran early this morning, a Lebanese Christian historian commented “This Persian’s glory at the moment is arguably greater than Caesar’s following Rome’s second conquest of Britain”. And the Iranian president did indeed throw much more than a stone at US-Israel projects for Lebanon, perhaps energized by the adoring public he encountered. A grateful nation extended to Mahmoud Ahmadinejad what one Bishop claimed was the greatest outpouring of popular support on the streets, all along this country’s sectarian divide, that the Republic of Lebanon has ever witnessed including the May 10, 1997 visit of Pope John Paul II. An important reason for the outpouring of popular support was the quarter century of Iranian assistance to Lebanon for social projects, and for rebuilding much of Lebanon following the 1993, 1996 and 2006 Israeli aggressions. Massive aid that was detailed by Hezbollah’s Secretary-General in a recent speech and the amount of which is estimated to be in excess of one billion dollars. Iran’s President is widely believed in the diplomatic community here to have promoted sectarian unity in Lebanon, calmed the current political atmosphere, and delivered on offers of more desperately needed economic projects via 17 bilateral agreements. A particularly appreciated offer throughout Lebanon is Iran’s major pledge of an electrical complex that will deliver 7 times Lebanon’s current power supply, which in 2010 still sees power cuts throughout Lebanon. The current deficiencies range from 3 hours to 12 hours daily power cuts everywhere in Lebanon plus total blackouts for days at a time in some areas. 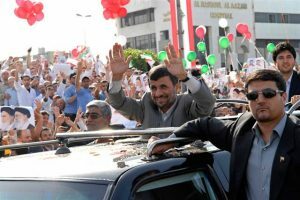 Iran’s President is widely believed to have achieved a major advancement for Lebanese stability, sovereignty, and independence. The throngs were cheering, waving, and shouting their admiration. Local media used descriptive words like “rock star, rapturous, massive affection,” to describe his reception. Wretched Palestinian refugees, tightly shoe horned into Lebanon’s squalid UN camps, denied even the most elementary civil rights by an apathetic international community and some of the local sects, could be seen along the route. Many with eyes moistened, perhaps by Nakba memories and tears of hope for the early liberation of their sacred Palestine and the full exercise of their internationally mandated and inalienable Right of Return to their homes. Refugees, plenty of them illegal, Iraqis, Afghans, Kurds and others, urging the expulsion of occupation forces from their countries and the restoration of their former lives, waved and blew kisses. Lebanese domestic ‘guest/slave workers’ from Sri Lanka, Ethiopia, Sudan, Philippines, Bangladesh, and other countries could be seen in the crowds along with Syrian construction workers. Also a sprinkling of Stendhal “Le Rouge et le Noir” characters who, seeking secure advancement in life, have fixed themselves to one or the other, both requiring that they be seen publicly at such an important event. Close to 750,000 people, or approximately one quarter of the total population of Lebanon, of all ages and stations in life, appeared at the main road from Beirut’s airport and at other events during an intense two-day frenetic series of appearances. Red, green and yellow rose petals, the colors of Iran’s flag, greeted Lebanon’s guest. Due to time constraints, some events for which much preparation had been made were “postponed”, including an “American Town Hall Meeting with President Ahmadinejad.” It was to include 15 Americans currently in Lebanon as academics, business people, students, housewives, and NGO’s, in a much anticipated US political campaign type format with Iran’s President joining an informal dialogue with his interlocutors. At Al Raya Athletic field in South Beirut, often used for popular Hezbollah events, an estimated 150, 000 people crowded onto just the main field boundaries, one Hezbollah source reporting that it was the largest gathering inside the field ever seen. Thousands of other attendees spilled onto the side streets where huge TV screens has been set up, and vendors hocked roasted ears of corn, boiled balila beans, kaak asrounye (baked bread with filling) various treats, including chips, cotton candy and soft drinks. Driving around the area on the mercifully cool autumn evening by motorbike, one could see thousands more gathered at several dozen Dahiyeh outdoor cafes and store front shops where families and friends gathered to watch on the proprietors’ outdoor TV screens. Some of the adults smoked arguila water pipes and little kids played, happy to be allowed to stay up late while teenagers appeared contented to get a day off from school and an evening without homework. Lebanese and Iranian flags were fluttering everywhere without huge numbers of Hezbollah flags displayed in keeping with the message that this was an official state visit. 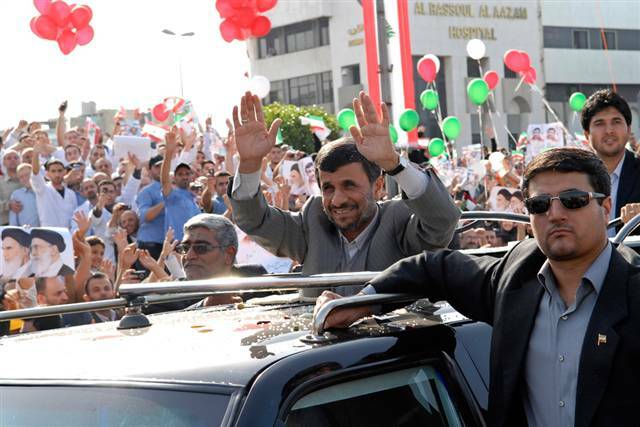 President Ahmadinejad of Iran was invited by President Michel Suleiman of Lebanon on behalf of every Lebanese, including the majority of Lebanese who live in the Diaspora. Deployments of Suleiman’s Presidential guards were the ones seen to be providing security for Iran’s president with Hezbollah security largely out of site, except for occasional fleeting glimpse of Hezbollah sharpshooters in windows throughout the assembly area. They also surfaced quickly if a dispute or argument flared up in the packed crowds. In these few cases a representative of Hezbollah would apologize for the crowded conditions and ask for patience and understanding during the event. Almost everyone laughed at his joke. Almost everyone laughed at her joke. Then, exuding an easy self confidence and speaking American accented English while obviously having a good time, the student noticed one seemingly horror-struck humorless lady wearing a light brown business suit and heels who a security guy later confided was suspected of being a US Embassy plant. “Just teasing”, she assured the woman, as she offered her hand in friendship to the flinching guest who glared uneasily at the hostesses’ hand as if it held a dead rat or might bite hers. “Why are you Americans so serious?” the loquacious hostess smiled. “Do you agree Iran and America are destined to be good friends after our countries are finished with this problem?”, and she gestured with her head south toward Tel Aviv.